One way or another, I'll be up in here on Oct 2. 4. The only way to purchase a CU-UGA ticket from the CU athletic department is by ordering a full season ticket or a "3PACK"
While not advertised in any way on their website, the CU ticket office is offering a 'promotion' called the 3PACK, which will allow anyone to purchase a ticket to 3 games: Hawaii, Georgia, and Kansas State. Endzone 3PACK tickets start at $130 and go up (considerably) from there. To view and/or purchase these tickets, go to this page and enter 3PACK in the promotional code field, and then click on "National Championship Pack"
1. UGA Athletic Department. The cutoff score was 38,500, which means two things: 1) Colorado didn't give UGA that many tickets and b) only those whose lifetime UGA contributor status is "baller" will be getting tickets from UGA. If you are not one of them, or don't know one of them, I am guessing that more than a few people bought them who are not going, and that there will be a small secondary market for these on the UGA message boards. 4. Bring Cash to Boulder. 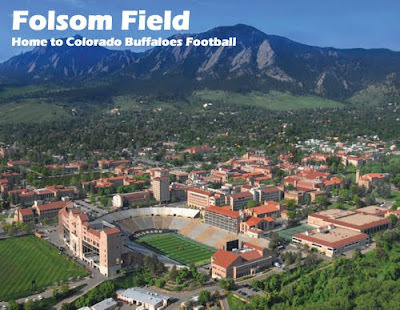 Below is a seating chart for Colorado home games at Folsom Field. The red sections (2, 3, 101, 102) are labeled "visitors", so this is what CU has given to UGA and where the bulk of UGA fans as well as the band will be sitting. Use this knowledge accordingly in your ticket acquisition hustle. Additionally, CU has a sweet interactive seating chart which shows you what your view of the game will be (just click on any section of the map to see your view). This is very helpful; spend a few minutes looking at different places around the stadium, which should then inform your seat desirability/willingness to pay matrix as you work on getting your tickets. StubHub is similarly overpriced, although this is almost always the case this far out from a game. Worth bookmarking the page and checking back between now and the game. At current prices for endzone seats ($125 plus stubhub fees), it would be smarter to just get the 3 pack for $130 and then hope to get a little of your money back on the others by selling them at a massive discount on Craigslist or team message/ticket boards. I think in this case option 4 may well be the best bet, and waiting and playing chicken is probably the way to go at the moment. Worst case scenario is that it is indeed a hot ticket and you end up paying $100-150 per ticket in Boulder the day of the game or day before, but even if you do that is equal to the current options for crappy seats, and I think the odds of this scenario coming to pass are less than 20%. Frankly, Colorado have been a poor team the past few years and there is no reason to believe that they won't be poor again this year. They have 3 games before we arrive in Boulder: v. Colorado State, @ Cal, v. Hawaii. On paper they beat Hawaii and lose at Cal, and 2 of the last 4 years they have lost to in-state rival Colorado State, so they may well be 2-1 or even 1-2 come October 2. Either of these scenarios should ease the ticket market, especially if they are 1-2: after the crap seasons they've had recently, there's a decent chance their fans will already start to give up on the season and the ticket prices will drop considerably. If you went to Arizona State in 2008 then you know how a hot ticket can lose literally all of its value- an unexpected ASU home loss to UNLV made our extras *literally* worthless. I understand that CU fans are far less fairweather than ASU fans, but you get my point. Additionally, there is no reason to assume that Georgia will roll into Boulder undefeated at 4-0 and/or even ranked, especially with a freshman quarterback and the fact that we were pretty crap ourselves last year. It is well within the realm of possibility that we lose to South Carolina or Arkansas or at Mississippi State, or more than one of those, taking further shine off the game and thus ticket demand and prices. This makes me feel that waiting it out at least until the first 2 weeks of the season have been played is the wise move here. Anyhow, agree or not, this is the current situation and these are your options. See you in Boulder in 9 weeks. Our last conquest: Arizona State 2008. Awesome post, great advice. I've also been looking for an interactive map. I've been debating for a week or two what to do, and honestly, I'd rather pay an overpriced $130 for a single ticket that is where I want, than a $130 for 3 tickets at the top of the stadium (granted it's not very big). Colorado has been taking lessons from Georgia Tech. They know who will be buying tickets for that game. Any free Cokes and hot dogs to go with those tickets? Where is the team hotel? If yall know any students, I would get them to get buy one for you. Look at the interactive stadium views at CU's web site. The stadium is only ~55k. There is not a bad seat in the house (i.e., nothing like the Tech Deck at Sanford). The ones labeled for away fans are pretty awesome seats (akin to 330's at home) by the look of it. 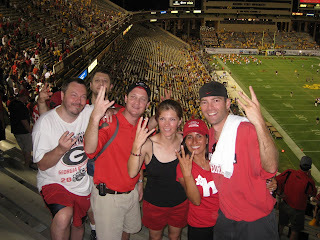 I feel sorry for the UGA fans that get stuck in section 101. Those look like awful seats. Are you searching about horse racing tips and strategies.This site I will share will give you free information on it.Check it out,it's great! it is a great stadium and those tower at the side of it. They look even better.